Andrew Pawielski is a battle-tested broker at Daniels Trading. His monthly webinar series is designed to give you a three-dimensional view of the markets. By looking at the impact of market relationships, order flow, market profile and trading volume based on news, trends and seasonal changes, he helps you know exactly what to do—and, more importantly, what NOT to do. All Webinars Begin at 9:15 AM CT! Fill out the form below to sign up for the full series. You’ll be registered for all 10 sessions, and get reminders each month. After the session, you’ll be sent the recording so you can watch it again, or catch up in case you missed it. It’s easy, it’s fun, and it’s going to help your career. Sign up today! Fill out the form to register for the series! Sign up to watch all year long! Are you looking to add an additional source of income by trading? Are you looking to dip your toe into trading but still maintain a full-time position? Do you need to prove yourself as a profitable trader before you make the flip full-time? You are not alone. The goal of this webinar is to share strategies for traders who currently work full-time outside of trading. It will review tools and trading resources that commodity broker Andrew Pawielski has cultivated over 12 years to help traders schedule their day and lighten their workload. Help you identify these setups using three key phases in charts. Show you effective ways of pinpointing these phases. Teach you how to use the TAS Market Profile tools to create technical trading hypothetical setups for you to trade in the futures markets. Through technical analysis and volume profiling, traders often pick out support/resistance areas for trading entries and exits. The question is, once you get to a good area, how do you know if it is a good trade to take? In this webinar, through the use of volume analysis, other trading tools, and multiple time frames, Andrew will help you build confidence for when these trade setups actually begin hitting your targeted entry locations. This webinar will teach you how to develop multiple confirmations for trade setups using the above techniques. When traders look at charts on longer-term time frames or through volume profile, it is considered a macro view of the markets. When traders get to those levels, they need to see how the actual market is trading in real time. Is there big buying? Selling? Traders can look for areas where buyers and sellers may get squeezed and wait to enter the trade at that point or use the information for a limited amount of risk. This webinar will go through the process of using medium- to longer-term analysis of charts, and then show how to incorporate order flow and real-time buying/selling as a confirmation of entry and potential risk. Large volume trades can control the market. It’s important for traders to find where they can get in and where they can get out. 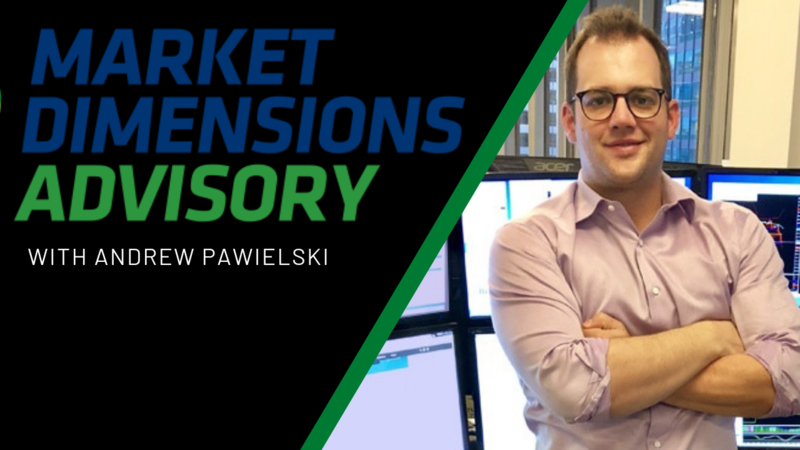 In this webinar, Andrew Pawelski shows you ways to locate these bullish/bearish buying and selling locations and use that to your advantage. This webinar will show you how to track large volume trading and order flow to trail risk on positions. You will also learn how to find locations where you can see a reversal develop before a trading chart will show you. Are you stuck forcing trades or not seeing setups you like to trade every day? So many people learn a technical approach and limit their view to just one market. Once you’ve learned how to use the TAS market profile tools and other volume analysis tools and become proficient with them, shouldn’t you execute the best setup, regardless of the market? How to incorporate a profile scanner into your daily routine. What filters to use to locate swing trade setups that are in play. How to use charts to formulate your trading hypotheticals to take action. How to use these scanning tools to locate strength and weakness in market sectors to help build a technical bias. One of the most overlooked areas in trading is trade performance and journaling. Some traders may know the P/L swings of their trading, but specifically breaking down each trade, market, and trade setup is not something average traders do often. In the professional prop trading world, traders would have a risk department or trade manager who would track your performance and cut you off if you were losing too much money. As a self-directed trader, you need to be able to manage this for yourself. This webinar will explore a simple yet robust tool that connects directly with your trading account here at Daniels Trading to track all your trading and help you create trade journaling in real time. That way, you can track performance, mindset, and setups and begin to understand what is working and what is not working. This webinar focuses on the use of seasonal spread trade setups and how to apply the TAS Market profile trading tools to assist in trade confirmations. The seasonal spread tools we use for the Seasonal Spread Trader. How to incorporate volume profile. Other technical tools to help confirm or deny the seasonal spread trade, where to enter/exit, and how to manage the position. If you are looking for a great way to participate in futures seasonals, this webinar is for you. Information overload can be a large problem when you are exploring something new or developing a new skill. Where do you start? What are good resources? This webinar dives into 5 ways to help you stay on top of developing and maintaining your trading education and skills. As with all skills you hope to master in life, consistency is key to your success in trading! This webinar scratches the surface of a large topic: mastering a skill. There are many studies, books, and other resources that cover the topic of what it means to “master” a new skill. Go through some of the key concepts of mastering a skill. Explore how you can start your journey of mastering trading tools. Focus on resources you can use as you gain mastery. Did you have a plan for your trading this past year? Did you stick to it? This webinar will go into tips to consider when building an actionable trading plan. A trading plan does not need to start at the beginning of each calendar year, but if you are actively trading or looking to start trading this year, it is encouraged to create a plan.